You're out boating on the lake, and your bobber sinks. You've got something on your fishing line! You reel it in, but instead of dinner, you've snagged a collection of plastic bags. Going to the beach shouldn't involve dodging garbage, which is why we wanted to partner with Clean Jordan Lake for their Annual Fall Trash Cleanup. They tackle illegal dumping in common litter sites along the shoreline, working tirelessly on trash prevention strategies to preserve the area. Jordan Lake covers about 14,000 acres and is surrounded by 180 miles of shoreline. Due to the lake's size, Clean Jordan Lake staff and community volunteers schedule semi-annual cleanups to remove trash from the area. Over the past eight years, they've collected thousands of bags full of trash and more than 3,900 tires. To help with the fall cleanup on October 14th, we donated a 30 yard dumpster. 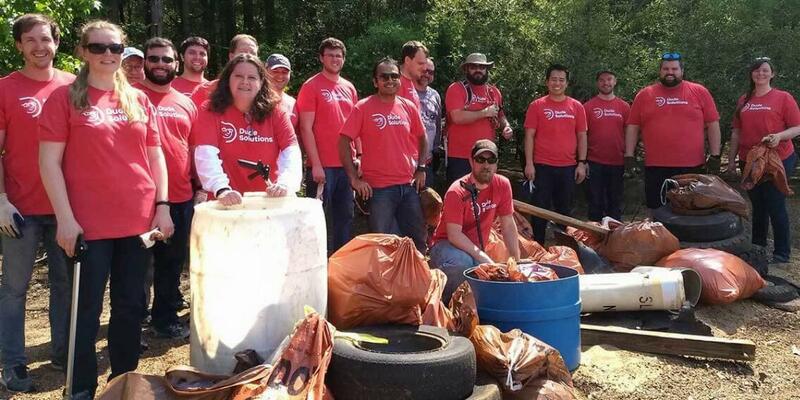 "In just two hours, volunteers removed 237 bags of trash and a whopping 76 tires from the Stinking Creek shoreline." "Most of the tires and more than half the trash were from a fairly short section on the south side of the creek," explains DiGiano. That section of shoreline has never been the focus of a Clean Jordan Lake cleanup before, and other organizations also chipped in with in-kind donations. In the past, boats have been used to ferry volunteers and trash from dump sites to collection points. DiGiano says that process was simple for this particular event, "thanks to having the Corps of Engineers pontoon boat, another donated from Crosswinds Marina and a third boat provided by Dan Brubaker, a faithful volunteer appearing for his 7th time!" Cleanup Fact: Lake levels directly impact how effective a cleanup will be. For Clean Jordan Lake's Fall Cleanup, lake levels were 3 feet below normal, exposing more trash that would have normally been concealed. Our goal is to build genuine partnerships with local nonprofits to build stronger communities through a clean and healthy environment. Do you know of a community organization planning a cleanup? We'd love to help out! Shoot us a quick message and fill out our dumpster donation form.